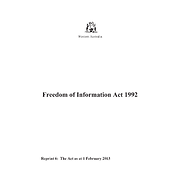 Freedom of Information Act 1992, 15 December 1992, courtesy of State Law Publisher of Western Australia. The Freedom of Information Act 1992 (076 of 1992) outlines the way in which information held by government can be released. People who were in out of home care will often have to make an application under this Act so that they can get access to records. The Act has provisions for access to information for and about children under 16 years of age and people with intellectual disabilities.